Future Technology Devices International (FTDI), available through GLYN High-Tech Distribution , have announced the availability of their 5th generation of USB to UART/FIFO ICs. The two new devices support the 480 Mb/s USB 2.0 Hi-Speed specifications. 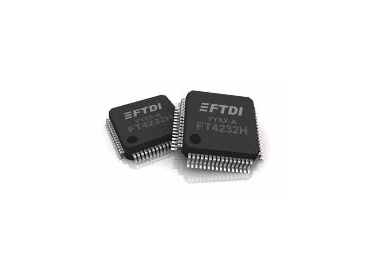 The FT2232H and FT4232H devices have the capability of being configured in a variety of industry standard serial or parallel interfaces such as UART or FIFO. The FT4232H offers four configurable interfaces and the FT2232H two configurable interfaces. Two of the FT4232H’s interfaces and both of the FT2232H’s interfaces can be configured as UART, JTAG, SPI, I2C or bitbang mode serial interfaces with independent baud rate generators. The additional two interfaces of the FT4232H offer UART or bitbang options. In addition, the FT2232H can be configured as a dual FT245 FIFO, a host bus emulation mode, a CPU interface FIFO mode or a fast opto-isolated serial interface mode. Both devices support a data transfer rate up to 12 Mbaud when configured as an RS232/RS422/RS485 UART interface and >25 Mbytes/second over a parallel FIFO interface (FT2232H only). A USB protocol engine controls the physical Universal Transceiver Macrocell Interface (UTMI) and handles all aspects of the USB 2.0 Hi-Speed interface. Both ICs integrate a Low Drop-Out (LDO) regulator, an internal 12MHz to 480MHz PLL and interface to an external EEPROM. These devices integrate the entire USB protocol on a single chip and provide extremely flexible interface configuration options. They provide a flexible method of interfacing to FPGAs and microcontrollers as well as upgrading legacy designs to accommodate USB communication.